If your family is like so many others in Ontario, this is the time of year you start to notice some of the kinks in your home comfort system. You don’t necessarily have to upgrade your furnace right now. There are a few things you can do to get better heating throughout your home as soon as you get home tonight. Have a quick look for all the air vents around your house. We tend to put our furniture where we want in a room, and sometimes that means blocking a vent. But blocking that vent can change the way air flows around a large space in the house. Even a buildup of cat hair and dust can block the vent enough to change airflow significantly. So slide your furniture around a bit and vacuum any gunk on the register. You can also redirect air to certain areas by partially closing some vents. 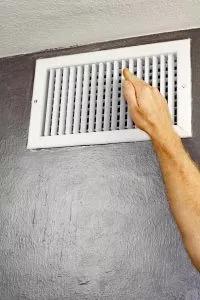 Less air can escape partially closed vents, and the air will redirect itself through the path of least resistance – to whatever area you leave the vents fully open. Keep the fan on at all times. Most homeowners leave the furnace fan setting on auto. The better setting is on. Your furnace will continue to circulate air even after the heating cycle has completed. It will only move air as the furnace needs to send heat throughout the house. The air will stagnate as soon as the heating cycle is over. Leaving the fan in the on setting may increase your monthly expenses by $5, but it’s money well spent. Looking for a new air conditioner? View our AC product catalogue. Get your air ducts inspected and cleaned. When your ducts spring a leak, air doesn’t get to the end of the line. Leaks force your furnace to work harder than it should to deliver warm air to the furthest parts of the house. It causes unnecessary wear on the furnace and results in more emergency repairs than a furnace should need (it should need 0, if you keep up with maintenance). Get your ducts cleaned and opt for a quality air filter to keep the dust and other debris out of the ducts for good. Need air conditioner repairs? Learn more & book your repair visit. Insulation keeps conditioned air from leeching into the outside atmosphere. Whether it’s warm or cool air you want to keep in the house, better insulation in the attic will help get the job done. An investment in highly rated insulation is always smart. Scheduling automatic temperature changes through the day. Allowing you to control your furnace (and other home comfort systems) from anywhere in the world. Helping you adapt to the way your home absorbs and releases heat through the day. You may need to deliver heat more aggressively to maintain a comfortable temperature at different times in the day. A Smart thermostat is a powerful tool that many of our customers have upgraded to this year and will continue to grow in popularity. If you can’t strike the right temperature balance throughout your home, perhaps it’s time you gave ClimateCare a call. We can help get you comfortable in every room of your house. Start by locating your nearest ClimateCare retailer today.